The friend who was with me said, "I wonder where the color comes from." We were trying to look for two shells with similar colors, patterns, and approximately equal sizes, and it was hard, even though we were looking through a large collection of similar shells. What determines this ornate pigmentation? Is it influenced by environmental factors such as the minerals in the water? Does it have anything to do with the age or health of the organism? Or is it purely genetic? Is this determined by the same basic biological principle that determines the color of human hair, or is there something different at work in shells? This post is pretty well written and seems to say that the evolutionary forces that produce shell color like this is not known. There are suggestions that the color is camoflage or the result of metabolic byproducts or that the pigments serve to strengthen the shell. Its hard to believe some of these theories given that some shells do fine without coloring (at least that humans can see). Structurally, shells are living things. [They consist of many layers of thin irregular calcium carbonate hexagonal plates that make the mineral portion of the shell. The plates are held together by a protein glue and renewed by cellular action]. Whatever their evolutionary motivations, the colors are biomolecules which are in the biomatrix binding the plates together. 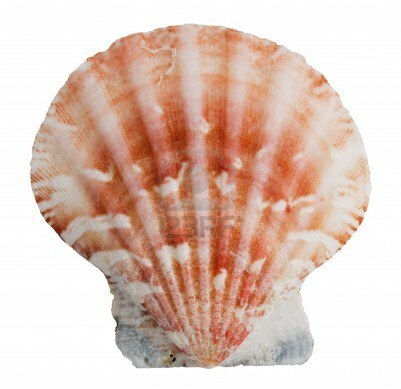 This is a reason that shells that are left out to dry in the sun can become bleached and brittle. I wish I had some better references about the shell structure, but I'm remembering a lot of this from a one afternoon book report given in a class, not from any intensive study on my part. This has influenced some ideas about things like tank armor, by the way. At least there is funding for biomaterials research by agencies interested in tank armor. Lamellar armor made of segmented plates can withstand tremendous impacts at a single point like a shell being dropped from a great height by a seabird or a shell hitting a tank. Plates just a few microns wide and a fraction of a micron deep shaped like irregular hexagons are hard to make if you aren't a mollusc so far though. We were wondering the same thing after a day at the seaside. It's apparently pretty complicated. Here are a couple of articles I found about it. "Mollusc shells have vivid colours and intricate patterns, but the pigments are practically unknown." "The same colour in different taxa may be due to different pigments; different colours in the same taxon are due to different pigments; different colour saturation is due to different concentration of the same pigment." "All the... coloured parts of the shells can be satisfactorily explained as due to polyenes and aragonite. Polyenes can be pigments, coloured compounds, as found in parrots' feathers..."
"... the extraction and identification of pigments is extremely difficult. For example, in one recent study, more than 30 kg of shells of Haliotis discus hannai were required to obtain only 2.7 mg of purified pigment"
"Pheomelanins are macromolecules that contribute to the colour of human red hair, and although most commonly known in mammals and birds they have recently been identified as the screening pigment in the shell-eyes of chitons . Pheomelanins may be brown, yellow or red in colour." "There was no resolvable pattern of association between trace elements and pigmentation due to either porphyrins or eumelanin." I would think that the minerals that are in the immediate environment have quite a bit to do with the color that is manifested in each shell. Not the answer you're looking for? Browse other questions tagged genetics marine-biology pigmentation molluscs or ask your own question.